Montpelier, VT. Good. 1842. First Edition. Softcover. Yellow wraps with tied binding. Wraps show soiling, chipping and creasing near edges and corners, and the booklet has a vertical crease from folding. Foxing to pages and the top corners are dog-eared. Pages are starting to separate from top edge, but binding is intact. Signed by the Governor on the front wrap. The Governor's message on the state's business. 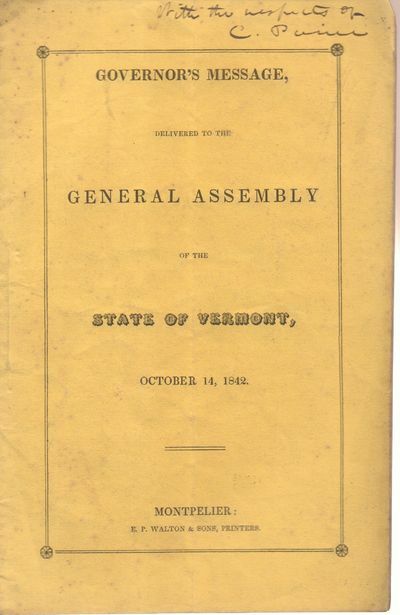 One of 200 copies printed for use of the Senate. Paine was the 15th Governor of Vermont. No copies in OCLC. ; 8vo 8" - 9" tall; 12 pp; Signed by Author .